Home Ministry of Railways PENSION RAILWAY BOARD Furnishing of Specimen signature of the officers of the Zonal Railways and Production Units authorized to forward the Pension Payment Orders to the banks. Furnishing of Specimen signature of the officers of the Zonal Railways and Production Units authorized to forward the Pension Payment Orders to the banks. 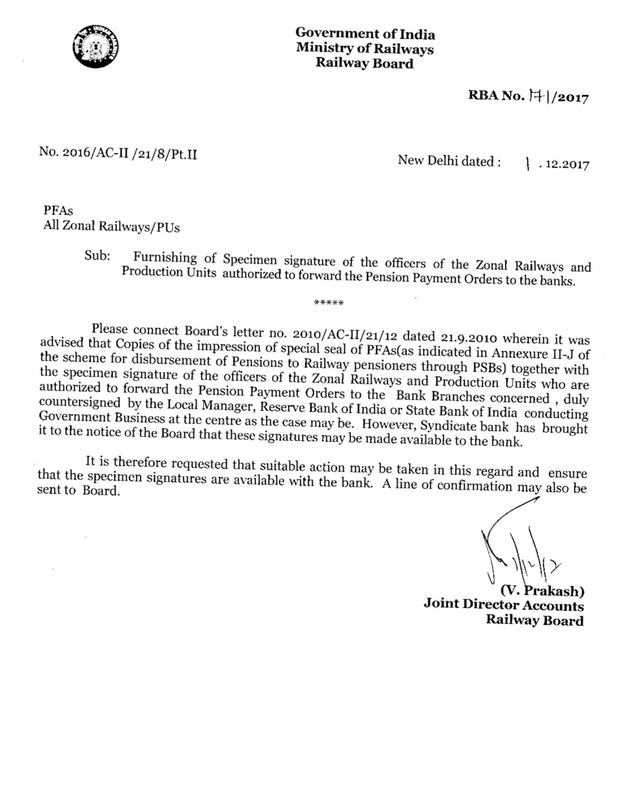 Sub: Furnishing of Specimen signature of the officers of the Zonal Railways and Production Units authorized to forward the Pension Payment Orders to the banks. Please connect Board’s letter no. 2010/AC-II/21/12 dated 21.9.2010 wherein it was advised that Copies of the impression of special seal of PFAs(as indicated in Annexure II-J of the scheme for disbursement of Pensions to Railway pensioners through PSBs) together with the specimen signature of the officers of the Zonal Railways and Production Units who are authorized to forward the Pension Payment Orders to the Bank Branches concerned , duly countersigned by the Local Manager, Reserve Bank of India or State Bank of India conducting Government Business at the centre as the case may be. However, Syndicate bank has brought it to the notice of the Board that these signatures may be made available to the bank. It is therefore requested that suitable action may be taken in this regard and ensure that the specimen signatures are available with the bank. A line of confirmation may also be sent to Board.